at. It is such an easy, but super cute project. I absolute love it and I think you will too! Glue & lots of it! 1) Put glue all over the paper plate. 2) Add cotton balls, lots of cotton balls, enough to cover the entire plate. 3) Place a cup/glass upside down on a piece of black fabric or felt. Trace using a piece of white chalk or white crayon/pencil crayon. Cut out the circle. 5) Glue the nose on top of the cotton balls, in the middle of the plate. 6) Glue the two ears to the back side of the plate so the top half of the circle sticks out from the top of the plate. 7) Glue on the googly eyes. 8) Make “candy cane” shapes with the pipe cleaners and glue on below the nose. 9)Tie a bow with the ribbon and glue it under the pipe cleaners. 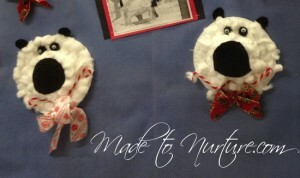 This entry was posted in Arts and crafts, Winter Craft and tagged animals, kid's crafts, polar bears, Winter craft. So cute! I used to teach 2nd grade and this would have been fun! That is a super cute craft. I was looking for something to do with my kids this week. That will be great! Such a fun craft-my kids will love it! fun craft idea to keep kids busy 🙂 and their little minds creative. What a fun project to do with the kids. I’ve pinned it to try later. These are some cute crafts. I bet my boys would have a blast with the polar bears. Such a cute craft idea! What a cute and simple project for the little ones. Thanks for sharing it.